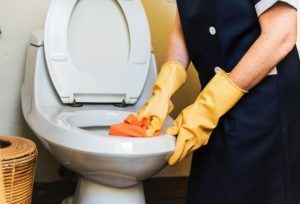 Dealing with toilets that are overflowing is an absolute nightmare, so it’s best to know what to do beforehand in case that situation comes about. Your bathroom is an area of your home that you cannot do without. Everyone wants to have a functioning bathroom, especially when it comes to your toilet. Issues with your toilet could spell catastrophe for your home’s wellbeing, but sometimes, problems cannot with your toilet cannot be avoided at all. Such is the case on the rare occasion that your toilet starts overflowing. When your toilet is overflowing, you are faced with an emergency plumbing situation that you must address right away. Here is what you need to do if your toilet starts to overflow. When your toilet begins to overflow, you need to make sure you hit the shutoff valve quickly and cut off the flow of water to your toilet. After you have followed the pipe from your toilet to the bathroom wall to turn the water flow to your toilet off, you will be given a window of opportunity to repair the issue of your overflowing toilet. This should not be too difficult to find, as the valve should be clear as day on the pipe that connects your toilet to the wall. You will want to make sure the valve is always working in case of an emergency, so it is recommended that you keep it clean and lubricated to turn easily. If your toilet is overflowing, you need to shut the water off. If the shutoff valve is immovable for whatever reason, your next step is to go and have a look inside your toilet tank. You can stop the water from continuing to flow by locating the rubber part in the tank and manually closing it if it is open. If it is already closed and your toilet has a float ball, manually lift that and hopefully your water should finally shut off. Usually, the reason why your toilet is overflowing is because there is a clog. The best way to get rid of a clog is with your toilet plunger. Your plunger is perfect for breaking up physical clogs in your toilet, stopping it from continuing to overflow. If somehow your toilet persists to overflow, then you may not be able to handle this issue all on your own, and you will need to call for professional help. If you’re ready to see how an upgrade can help your home, the experts at Mahon plumbing are here to help. Mahon Plumbing has been serving the Baltimore region’s plumbing needs since 1994. We’re ready to offer quality plumbing services and gas installation for both commercial and residential uses. Our tracks and employees are ready to handle the toughest of jobs. For more information, follow our blog or check us out on Facebook or Twitter. We’re able to offer 24 hours a day, 7 days a week emergency services. Please contact our Baltimore location at 410-766-8566 and our Pasadena location at 410-636-7944 if you have any questions or are in need of emergency services. This entry was posted on Friday, November 30th, 2018 at 3:09 pm. Both comments and pings are currently closed.